Soil salinity is a major abiotic stress affecting the performance of crop plants around the world adversely. Salinity can create a mix of complex interactions that affect plant nutrient uptake, metabolism, and susceptibility to biotic stresses. This negative interaction may reduce nutrient use efficiency and thus reduces the growth parameters. In addition to various management operations, such as crop management, to reduce the negative effects of salinity on plant growth, application of salinity-tolerant varieties or genotypes is a very interesting strategy to reduce the cost of salinity and environmental contamination. Salinity tolerance in plants not only varies widely among different species but is also strongly influenced by the environmental conditions. The salinity tolerance mechanisms of the plant are investigated at three levels of whole plant- cellular, and molecular levels. Particularly, the response at the whole plant is vital for some plants but is generally not used for all plants. It seems that cellular responses are conserved among many plants. 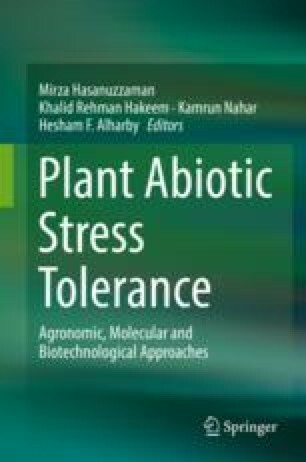 Considering the advances made in recent decades, breeding for increased tolerance through gene transfer and the production of transgenic plants is considered as excellent and low-cost method. Perhaps the most valuable outcome of the biotechnology program is to use molecular tools for the breeding programs. Identifying tightly linked molecular markers with the target gene and mapping it on the chromosome is an important goal for cloning the genes and marker-assisted selection (MAS). Newell N (2013) Effects of soil salinity on plant growth plant physiology. Available at https://pages.stolaf.edu/wpcontent/uploads/sites/253/2015/03/Salinity-in-Plants.pdf (accessed January 2019).